"I want to go to Greece - Greece - Greece - Greece" Are you guys listening? I,fuming with terrible anger of my last two days of 5 hours research ; rushed out my room in a fit.I assumed things would calm down a bit,my friends would bow down to my stubbornness until I quietly slept in my bed but the dreams still won't go - Those blue hues I was raring to touch - So obsessed with the idea that now any home which slightly resembled White and Blue of Santorini,my mind would immediately wander to that place.My dear College friends all of them tried to buy me out for Paris,Switzerland,Rome but I refused to listen.One of them after having failed attempt at trying to pursue me bluntly said "It's Goa but More Blue",watch the video - and added to it, "If Goa was painted more Blue in Color and if the Indian waters were more clean It would be Santorini dear.Plus these days the color of water can be changed virtually.Don't you know the DSLR's and the Special Effects.There's no point going there. "But I always saw a point.The point was "Yes I wasn't going to Paris,I wasn't Going to Italy but a place where Hollywood comes for vacation,where Bollywood chant rhythms like "Khuda Jaane". Disappointed and fairly heart broken , I took a refuge in three of my girl friends who had expressed interest in Greece a month back.I wanted Greece to be with my friends,with a gathering of people I knew or at least with people I have had met before.I was petrified if they would say no then I would have to go through another heart break.The girls said no as they had now made another plans.I understand.But how can they?Greece was my dream,I felt like saying "Understand" but I secretly knew that One day I will be in Greece and the world will hear my stories. When one door closes,another opens. thinking if I could just escape to Greece It'll be great.My bunch of new swimwear and shorts were longing to be soaked in sun-kissed beaches of Greece.That day never came.Till few days back,I got a letter from TBEX(Travel Blog Exchange 2014) where all the travelers from across the world meet in different locations,this time the chosen location is Athens.I checked my balance,may be all set.May be not so ready,but this year has to be Greece come what may - TBEX or non TBEX.The feelings oozed out of me "was Greece chasing me or am I chasing Greece? "Isn't it what we truly really want come to our hands,one day someday.And I shall wait. cellphone.When the prices are low or high that what I have searched for,I am notified by mail.So this tool isn't entirely new to me.I have previously searched for Oman,Scotland and lot other destinations on Skyscanner,it consolidates from everywhere and gives the best possible rate direct/indirect.Earlier,things were like people would plan London and then they would search Dubai and then they would say you know Bangalore - Dubai - London comes out to be cheaper.Now no such hassle. 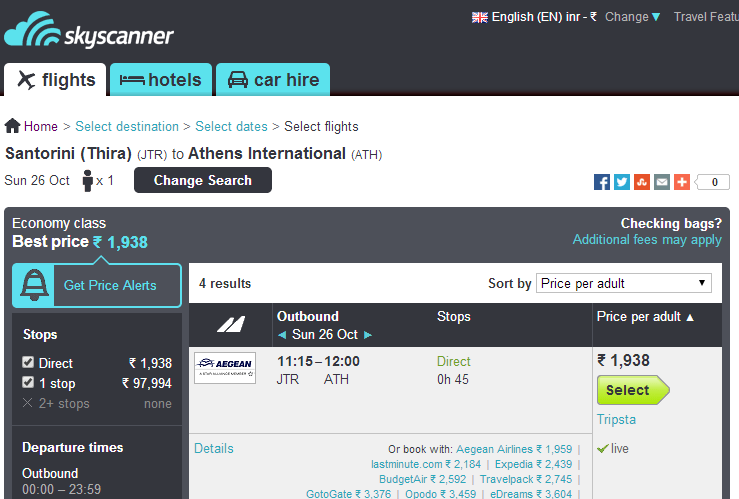 While searching for Skyscanner for the dates,I found that 17th Oct - 28 th Oct is around 41,271 return.If I book a day return prior,I would save around Rs 500 but I plan to attend the only festival in Oct we have that is National Anniversary of Greece called "Ohi Day" which is characterized by Military Parades. conviniently cover it on first half day. So after Landing in Athens on Day 1 and taking adequate rest from the Jetlag, I would head on to Acropolis.I will walk down the ruins,do some shopping around and would then perhaps head to National Ancheology Museum,Plaka Neighborhood(Old Town) or one of the great other museums.I might take a rental car or get into hop on hop off bus depending on how I feel for the day.But as the car rentals are cheap as listed,I might as well take a car. For me,Sleeping is just taking rest in the night.All day I would be out exploring. I don't need the posh superstars,but a clean simple room with great rating would do. 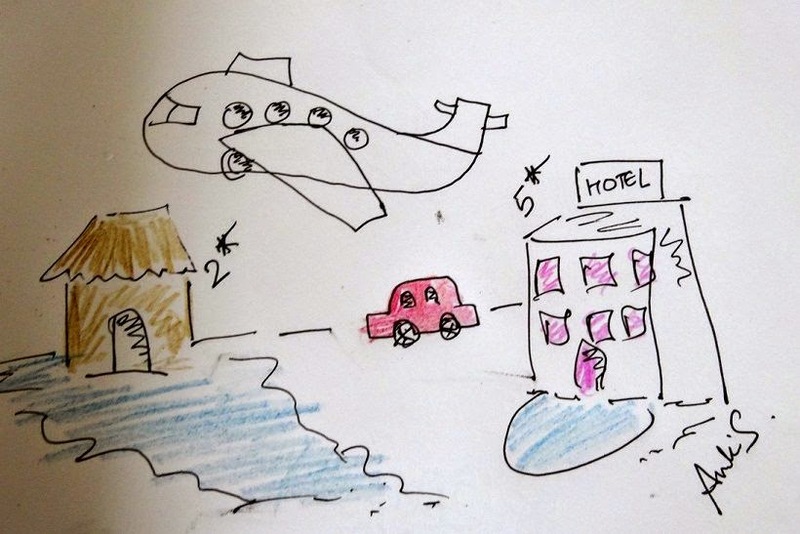 And Hostels are the best way to make friends or know the best hideouts,isn't it?I would rent a car if required or else I would walk and take the public transport. 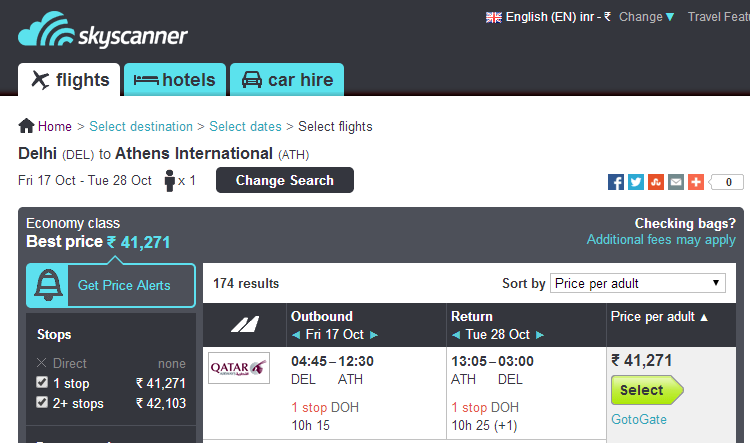 I was thinking renting car is costly abroad,but wow that was cheap! Next day I take a flight to Mykonos which is also called Ibiza of Greece.The pictures of Mykonos from Google reminds me of beautiful beaches,vivid nightlife,picturesque villages and traditional windmills.If I ain't going to Venice,Little Venice in Mykonos will do the full justice to the plan.It is said to have one of the most colorful quarters at Chora.I would then dab into my favorite sunscreen before I head to beaches of Elia,Super Paradise and Psarrou.I would then take a boat from Mykonos to Delos where the open ruins of ancient Santuary and theater are found. I fly from Athens to Mykonos and save my ferry time. 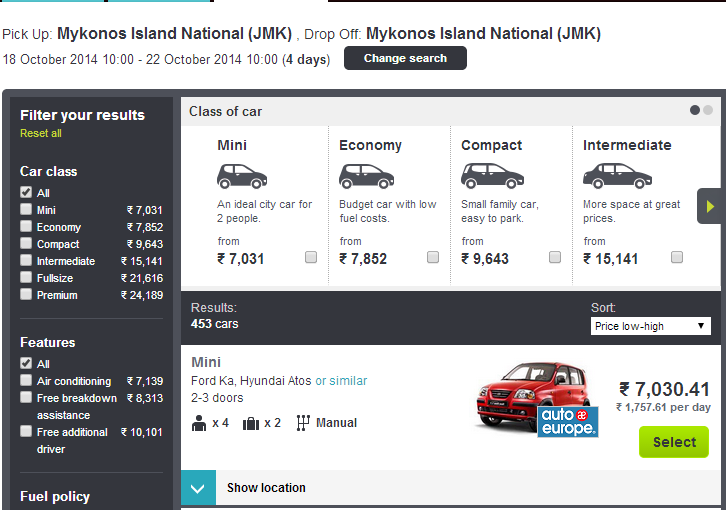 And plus its near to the Lighthouse.I would rent a car for 4 days which comes out to be pretty cheap. Slowly and slowly,I am realizing the fun of slow travel - i.e not rushing in to touch a place but knowing it in full details like "Why is Mykonos called Mykonos,what do they eat,what do people in villages believe in.And for next 4 days if you are wondering what I'll do,I would be in my search for the answers less known to the world.I might as well hire a bike or an ATV,but a car rental also sounds like a cool option. 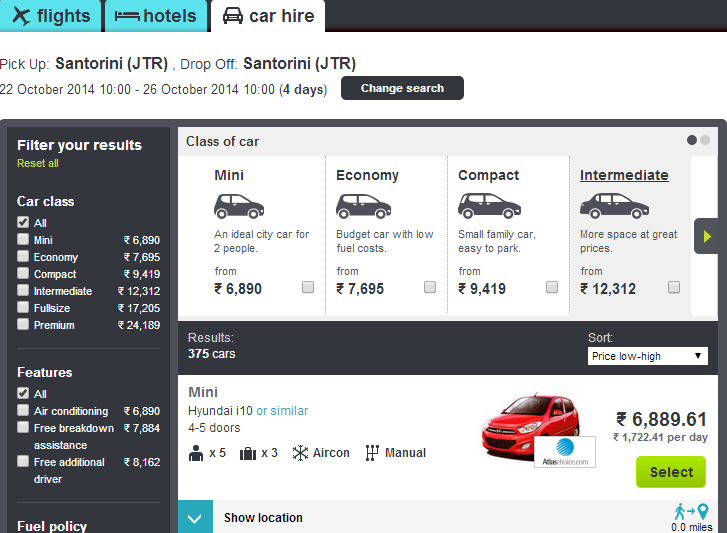 and book the Santorini Breeze Hotel which is cheap and has fabulous rating. 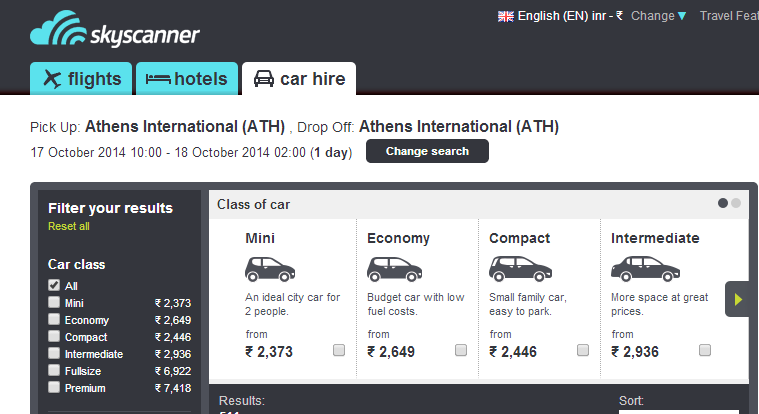 I would book a car and then head to Athens on 26th. I stay in Youth Hostel again and Fly back on 28th Afternoon. On 26th Night,I dance and dance at the popular neighborhood of Psiri and sleep a little more till 27th.I take a quick glimpse of the parade and fly in back happily to India. 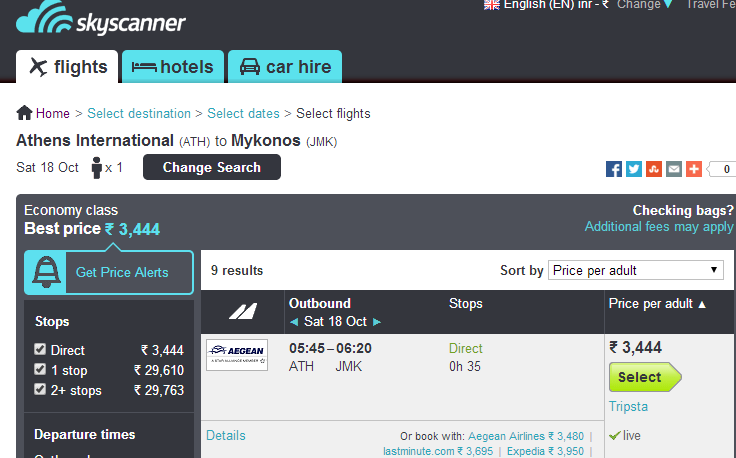 And for the remaining 20 thousand,I might head to Crete on 27th,stay there for a day and come back.It adds upto 7235 on my cost which comes out to be 89061.Adding onto Athens and Crete car hire we have the 1871 + 2372 = 4243 = 93304 . I could have easily chosen three countries in Europe in the budget given to me.But I prefer to know a country in detail ,and for the country like Greece,I rather stay at pleasure at my own pace than just mark several places on my bucket list. 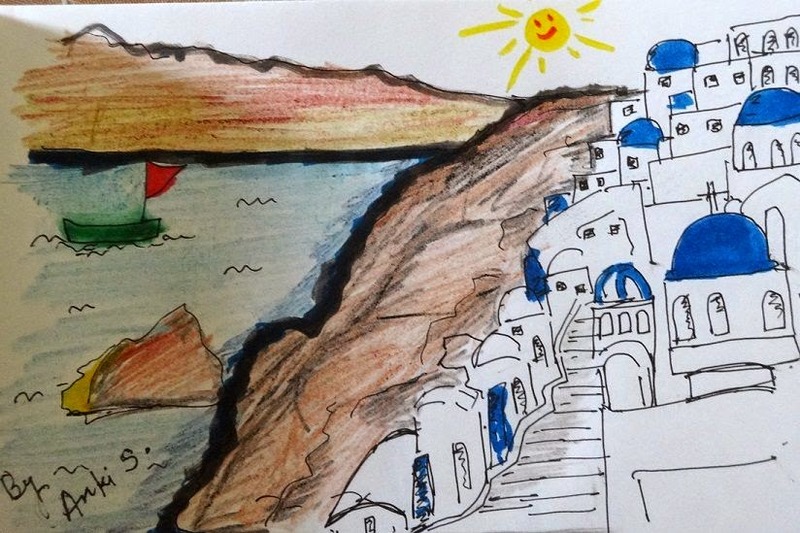 αντίο from my Greek Dreams.I hope I wake up and see myself in Greece someday.Until then,its just a dream I am waiting for. 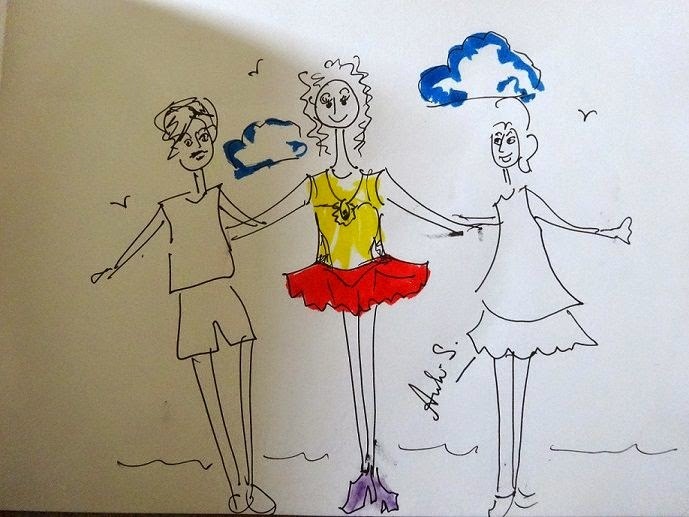 Wonderfully expressed, Anki! 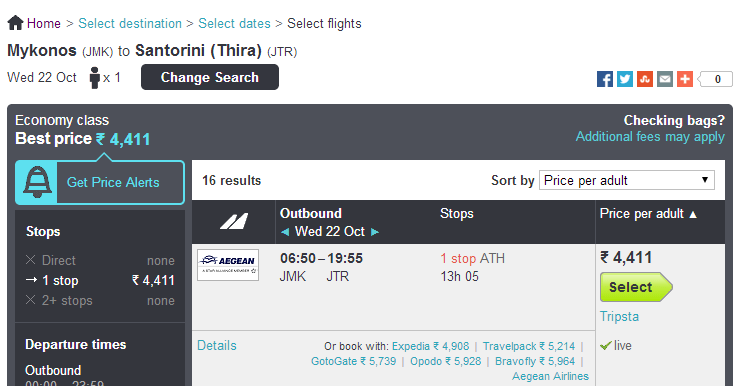 Even I wanna visit Greece! This is a winner post for sure. Wow that's a seriously well researched post! All the best! Congrats Ankita!!! Happy for you.. Well deserving!! Congrats! Deserving post. Do write a follow up post once you are back. Santorini is my dream destination.